The story of the Chapel of the Cross begins as the story of the Johnstone family of North Carolina. John T. Johnstone and his brothers, William and Samuel, began traveling to the new state of Mississippi in the 1820’s purchasing land. John initially bought 524 acres where the Chapel sits today from Jonathan Coleman who had a log cabin situated one hundred yards from the present day Chapel. Mr. Johnstone remodeled and enlarged this log cabin and then moved his wife, Margaret, and his daughters, Francis and Helen here in 1841. He named his plantation, Annandale, after his ancestral home in Scotland. Mr. Johnstone like his brothers came to an early death at forty-seven in 1848. Margaret buried her husband in the flower garden of the log cabin home. Never losing sight of the plans she and John made, Margaret began the construction on the Chapel of the Cross soon after her husband’s death. The Chapel is an example of Gothic Revival design with a lofty bell tower, tall narrow windows, and arched entrances. Designed by the noted architect, Frank Wills (an Englishman who would become the official architect of the New York Ecclesiastical Society), the Chapel’s bricks were slave made “river bottom” bricks, cast on-site from area clay. Inside, the beams and the floors were hand-hewn from oak trees growing on the plantation. Work was done principally by the labor force from Ingleside and Annandale plantations with the exception of some artisans such as plasterers and brick masons. These people were brought in from other sources available in the state. The pews and chancel furnishings were imported through a furniture dealer in New Orleans. The baptismal font was cut from three pieces of Italian stone and also imported. The pipe organ was shipped from Philadelphia. The outcome of the project was an exquisite Gothic chapel, complete in every detail, occupying ten acres on a low hill set amid towering oak trees. Consecrated on September 19, 1852, by William Mercer Green, the first Episcopal Bishop of Mississippi, the Chapel thrived for the next ten years, holding services regularly and providing religious education to all. Many, both slave and free, were baptized, confirmed, and buried at the Chapel. All worshipped together each Sunday. The Chapel survived the Civil War with only a loss of dignity—its bell was melted down for Confederate bullets. In the years after the Civil War, however, the Chapel began a slow decline that would last for fifty years. It suffered from bouts of neglect and abandonment until it was finally declared extinct by the Diocese of Mississippi in 1904. This prompted a Johnstone family member to intervene on its behalf, when Margaret Britton Parsons, granddaughter of John and Margaret Johnstone persuaded the Episcopal Dioceses of Mississippi to reactivate the Chapel in 1911, and the Chapel opened its doors once again. 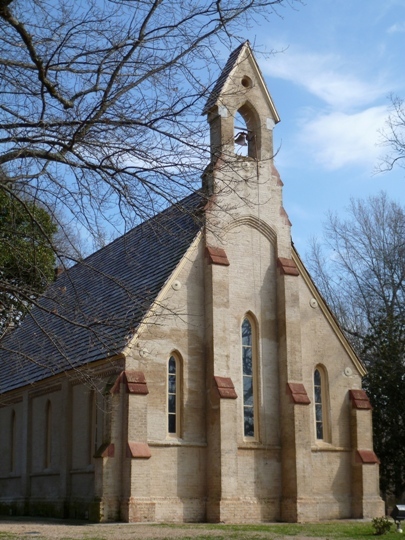 In 1976, the Chapel underwent a restoration, and in 1979, the United States Department of the Interior awarded a $50,000 grant toward another restoration; Mississippians rallied to the cause with the annual “Day in the Country”; monies were given from all over the United States; and today the Chapel of the Cross is not only a historic treasure listed on the National Register, but also a thriving, welcoming house of worship with an active congregation. The Chapel became a parish in 1985. The Chapel of the Cross reflects the deep, rich roots of our Episcopal faith, the founding families of this parish, and members of our parish community. In 2018, Steve Middleton wrote an original poem which imagines what passers by might have thought when Margaret Johnstone was originally constructing the Chapel in 1848. They still are. For more images of the Chapel, interior, exterior & historic drawings, visit our Galleries. You may also schedule a tour. Directly behind the Chapel and resting peacefully in the shade of the large magnolia trees, lies the historic cemetery. The once small family graveyard is now the final resting place of not only the Johnstone family but many others with fascinating stories and connections to the Chapel of the Cross. We honor the lives of those who are buried here both in marked and unmarked graves who forged the character of the Chapel. The deed for the Chapel specified that the additional land around the Chapel be used for a burial place for the Chapel members and neighbors who were close to the family, and for the burial of the direct heirs of the Johnstone family, regardless of whether they were members of the Chapel or not. In the cemetery there are a number of decorative wrought-iron enclosures surrounding individual family plots. The Johnstone family plot is surrounded by a superb period piece composed of flowers, leaves, and vines on a rusticated frame of gnarled branches. The name Johnstone is written in letters of iron on the gate. Margaret Johnstone had her husband’s body moved from the log cabin’s flower garden to the cemetery in 1852. John T. Johnstone, founder of Annandale, was the first to be buried at the Chapel. Next to the Johnstone’s are the graves of their oldest daughter, Frances, and her husband William Britton. Their home was Ingleside and their descendants worship at the Chapel today. At the feet of William and Frances Britton is the grave of Angelina Fedora Bassett Carter. Angie was born a slave but remained with the Britton’s until her death at ninety-seven. She asked to be buried in the Chapel’s cemetery at the feet of the Britton’s, the people she loved and served. On the west side of the Johnstone’s graves is the grave of Henry Vick who was killed in a duel four days before his wedding to Margaret and John Johnstone’s youngest daughter, Helen. A sorrowful procession, lit by torchbearers, made its way from Annandale plantation home to the Chapel’s cemetery. Bishop Green, had prepared An Order of Marriage but instead performed The Burial of the Dead that night. As the casket lowered into the ground, the clock struck midnight. A new day had dawned, May 21, 1859, Henry’s and Helen’s wedding day. Many thanks to our friends at Mississippi Public Broadcasting for allowing us to share this segment from “Mississippi Roads” about Helen and Henry. The Mann Family; the DeWees Family; the Bennett Family; the Greaves Family; the Yellowly Family; and the Thompson Family are just a few of the families who are buried at the Chapel. After the Chapel’s consecration in 1852, the Chapel’s matriarch, Margaret Johnstone, built the rectory. Architect A.J. Downing, who would later design the Manship House in Jackson, Mississippi, was secured for the task. In keeping with the Gothic Revival style of the Chapel, Mr. Downing designed a residence he called “Rural Cottage Gothic.” Lacy, hand cut trim, called bargeboard, decorates the exterior, while the interior features a large front hallway with Gothic arches at either end. The 4,000 square foot residence housed only three rectors. In 1866, Margaret sold the house to the Mann family, and it became the founding manse for the community of Mannsdale. The dwelling remained in the Mann family, inhabited by numerous descendants, and restored in the 1940’s by Lee DeWees and his wife, Pat. It was sold in 2000 and donated to the Chapel. The David Christian Parish Hall includes a 4,500 square foot Parish Hall, kitchen, and offices for clergy and staff. Architect for the structure was Robert Parker Adams. Since construction, interior renovations have been made by Sandy McNeal, acclaimed religious artist and creative stage set designer; Bob Moore, architect; Rick Suber, carpenter; and Fletcher Cox, sculptor. A focal point of the Parish Hall is The Tree of Life, a wall sculpture by Thomas Morrison. The following is Morrison’s artistic statement. Dedicated on October 4, 1998, the Education Building is 12,885 square feet, providing facilities for teaching all ages from infants through adults. The upstairs has spacious youth rooms. A special part of the building is the Covington Room furnished comfortably and beautifully with carpet, artwork, and a large conference table with upholstered chairs. The room is named in memory of Aston Covington. The Choir Room has a rehearsal hall and vesting room for the choir; the office for the Director of Music; Library; and the Flower Guild room.